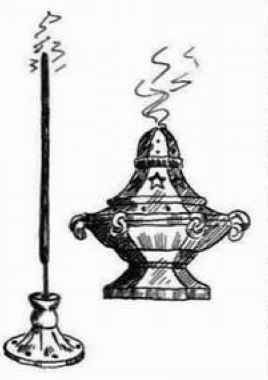 The cauldron is the one ritual tool that is positively charged by being the centre of domestic life and can replace the altar as a focus for less formal magick spells. If you can obtain a flameproof cauldron with a tripod, you can, on special occasions such as Hallowe'en, light a fire out of doors and heat up a brew of herbs and spices in the cauldron. When not in use, you can keep your cauldron filled with flowers or pot pourri. In your rituals, you can light a candle in front of the cauldron, fill it with sand in which to stand candles, or surround it with a circle of red candles to represent Fire. Wishes written on paper can be burned in the candles. Water darkened with mugwort may be placed in the cauldron, especially on seasonal festivals such as Hallowe'en and May Eve, and white candle wax dripped on the surface to create divinatory images that offer insights into potential paths.